There are undoubtedly many better things to be doing on a drizzly October morning than splashing around in a muddy field on the trail of a well that is well documented as having been destroyed around 30 years ago. But such is life, and today we found ourselves doing just that at Penmynydd near Llangefni. Penmynydd, which has also been known as Llanredifel, is the location the only church dedicated to St Gredifael, and until 30 years ago his only well too. Gredifael, whose feast is celebrated on November 13th, is virtually unknown. The Lives of the British Saints suggests with little certainty that he may have arrived in the area with brother Fflewyn in the mid fifth century. The fifteenth century church of St Gredifael is certainly much more interesting than his well. It is currently undergoing archaeological investigation and restoration with a grant from the Welsh Assembly’s historic buildings fund. It was very disappointing, though probably unsurprising, not to be able to find any way to gain access to the church at the time of our visit. The Lives of the British Saints tells us that Gredifael’s shrine, Bedd Gredifael used to be within the church and that lying on the shrine overnight would produce a cure for the fits. The church also contains important links with the Tudor royal dynasty, containing the tomb of Gronw Tudur, great uncle to Henry VII, The Penmynydd area being an ancestral home of the Tudur family. The well lay beside a footpath some 100 yards to the south of the church. It is clearly marked on all the Ordnance Survey maps from the late nineteenth century. It was situated within a depression in the middle of a field known as, Cae Gredifael. The Coflein record states that an early photograph shows a rectangular stone basin fed by the spring, and that early mapping shows a small rectangular feature (3m by 1.5m) beside a larger pond. It is unfortunate that no detailed description of the site was recorded by the Ancient Monuments Commission. The location identified from the recorded grid reference is in the centre of the picture below, and the following picture shows the church as viewed from the well. 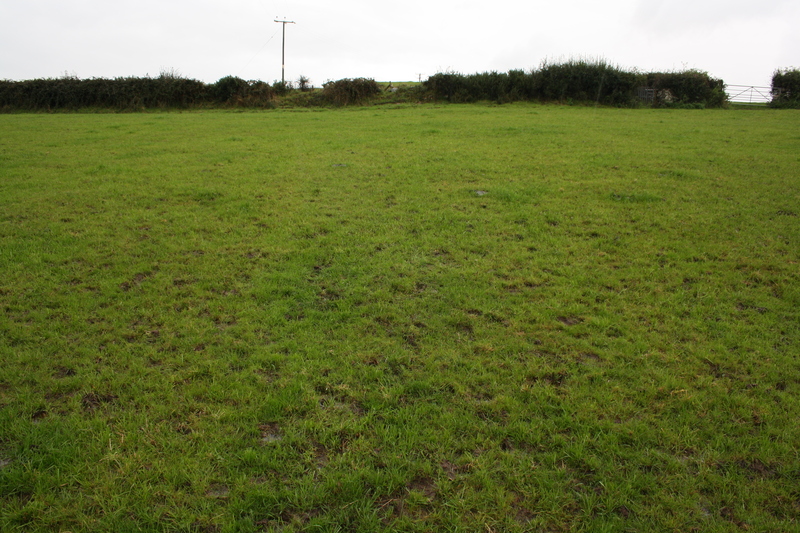 it is well documented however that it caused difficulties for the farmer in ploughing the field and was thus removed and ploughed over in 1986 with the water being piped away out of the field. Some effort was made in the 1990s towards a campaign to recreate it at the edge of the field, which seems to have come to nothing. The well had a reputation for being effective in the cure of warts, the remedy being to prick the wart with a pin until it bled and then to wash it in the spring. I can think of few better ways to spend a drizzly October morning! What a shame the well has disappeared,and the pricking of the warts first sounds a bit brutal.